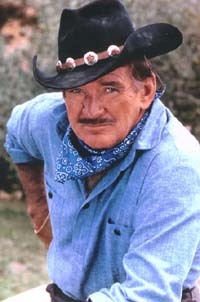 Rod Taylor played Sheriff Jonathan Grail in this time-travel/detective show with an Old West flair. The aging Taylor, with his handsome ruggedness, has a crusty dignity and poise which the less disciplined troublemakers rally around once they realize they're all in this together. Grail and the "outlaws" use the gold pieces from the bank heist to buy a ranch they name the Double Eagle. Grail also persuades them to form the Double Eagle Detective Agency, bringing old-fashioned justice to the modern world. A contemporary Houston police officer, Lt. Maggie Randall (Christine Belford), befriended the group, got them out of trouble and had a soft spot for Sheriff Grail. 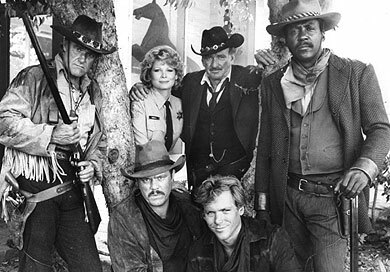 Wolfson "Wolf" Lucas (Charles Napier), Lt. Maggie Randall (Christine Belford), Sheriff Jonathan Grail (Rod Taylor) and Isaiah "Ice" McAdams (Richard Roundtree). Front: Harland Pike (William Lucking) and Billy Pike (Patrick Houser). The whole idea is for us to bring everything from the 1890s with us. The clothes, the horses, our attitudes, our way of doing business. You bring that to the computer age and it becomes what they call contrapuntal. The humor comes out of the contrasts and contradictions. It was funny as hell. We'd face a band of 50 terrorists with great bravery -- but a pop-up toaster would scare the living daylights out of us. If the weekly series can manage the quality of the first hour of the pilot, this here could be a purty durn entertaining TV show. Taylor thought "Outlaws" would be a sure-fire winner, but it quickly ran into problems: "We had a cult following that was tremendous," he said. "For four weeks we were the No. 1-rated show. Then CBS had a massive shake-up. They swiped all our writers and bounced us from one time slot to another. We sank like a lead balloon." The "outlaws" band together to protect some immigrant shopkeepers who are being harassed by thugs in a protection racket. The focus of this episode is on young Billy Pike (Patrick Houser), who goes to adult education classes to learn how to read and winds up thwarting a gang connected to the aforementioned protection racket. "Ice" is the center of this story, leading the fellas to New Orleans in search of treasure he buried there at the end of the 1800s -- after a duel with the man who used to own his family. The outlaws find treasure, romance and vengeance against the slaveowner's great-grandson. The Outlaws ride to the rescue of the owner of an independent taxi-cab outfit and her daughter. Amusing vignettes of each of the guys as taxi drivers open the show; the usual rousing shoot-'em-up closes it. It's a dark and stormy night, the Outlaws are trying to celebrate Sheriff Maggie's birthday, but storms and snipers keep them at bay. While trying to get out of their predicament, the boys reminisce, and the flashbacks include scenes of Rod Taylor and Charles Napier from an episode of "Oregon Trail." Very creative!